my Tentec Jupiter. The gear dates back to 1969. Using this station KA2F hopes to achieve WAC, WAS, and DXCC on CW, of course. 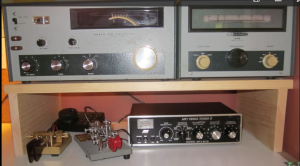 The HW-16 is not a transceiver but rather a Receiver and Transmitter in a single box. It offers 500Hz filtering and 50 watts output, with full break in.